Fried Chicken and Pie at Parkview Restaurant in Corning. I've been holding out on you. At least, that's what Grav will have you believe, and there's probably some truth to that. 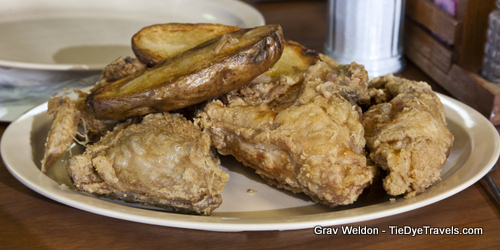 See, we know some of the best places to get fried chicken and pie in the state, and this isn't one we share much. But it deserves sharing. This place is the Parkview Restaurant in Corning, and it's been around for generations. But because of its remote location near our state's northern border, it does not receive the accolades it deserves. I first visited the restaurant in the early summer of 2008, on my way to St. Louis for a travelogue. 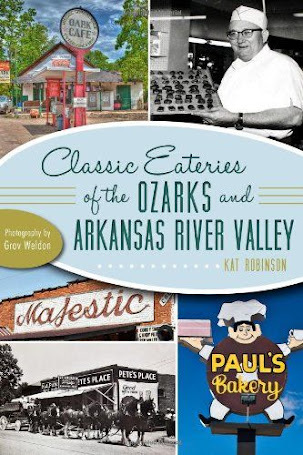 I had decided to travel US Highway 67 rather than taking the circuitous interstate route, and I ended up at lunchtime with cravings for things. I was, in fact, pregnant with Hunter at this point, and I wanted fresh tomatoes and other garden variety edibles. At the same time, I was searching for restaurants that I could write about on my (then) relatively new website. 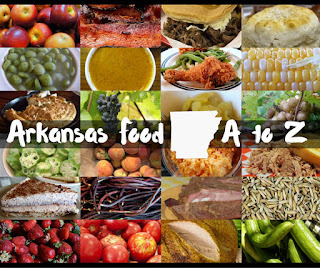 Already tasked to discover what Arkansas food was all about, I had spent the previous months dining at every little cafe or diner I came across, and this one on the right side of the road just inside of Corning looked promising. I pulled up around 11 a.m., walked in and was guided to sit in a soft booth seat near the front. The idea of fried food or even warm food on that warm day was unappetizing thanks to my nausea, so seeing the Cold Plate on the menu was especially welcome. This was a tuna salad sandwich (chicken salad was another option) with a bowl of potato salad, sliced hardboiled eggs, carrot sticks and tomato slices, lettuce and pickles on a plate for the bargain price of $3.85, and that along with a refreshing glass of cold iced tea put me right as rain. I made a note to get back to Corning as soon as I could. But as with many other things, it slipped my mind, especially as my pregnancy progressed and my radius of acceptable travel dwindled. And once Hunter was here, so many of my plans went right out the window. 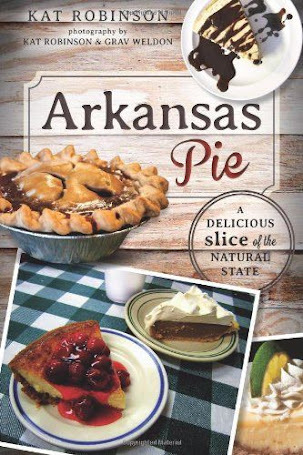 Four years later, almost to the day, I received that fateful message that would lead me to writing Arkansas Pie, and soon I was back on the road looking for great pies. And I missed this one. 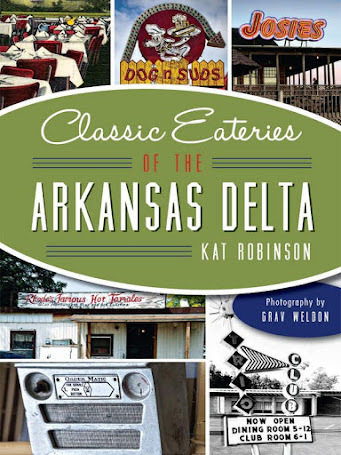 But I didn't miss it when I received the initial contract for what has become the Classic Arkansas Eateries series. 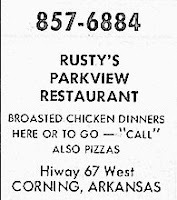 In fact, my earliest research for that book brought the Parkview Restaurant back to mind -- thanks to a matchbook. See, Corning is one of two county seats for Clay County (the other being Piggott to the east). It benefits from being the first town with any sort of facilities on the south side of the Missouri border. For many years, several hotels operated there for travelers coming into the state. Stay with me, here. Restaurant, the facility is commemorated in a series of postcards issued over the decades. One reads: Offering all conveniences to the traveling public. Twenty-eight rooms, tile baths, air-conditioning, telephone in every room, controlled heat, free television, Simmons Beauty Rest mattresses, free swimming pool. Beautiful city park adjoining for your pleasure. Restaurant and auto services next to motel. A really delightful place to stop. 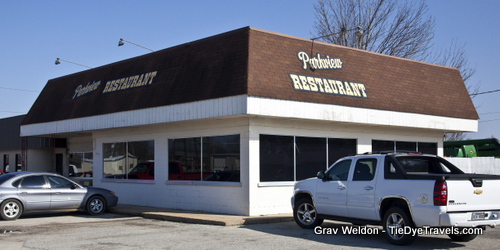 Grav and I made plans to head back to the Parkview Restaurant, and we finally got back up that way in March 2014. We'd been researching in Jonesboro and Paragould all morning before heading up and across to dine at the Parkview. and a Taco Burger lunch at Taco Rio. We'd had plenty, but an afternoon spent looking up defunct restaurants between points A and B had rendered us hungry for something that wasn't a burger or a biscuit. What'd we do once we were seated? We asked our waitress what to get. She told us to get the Whole Chicken Special. So we did. It wasn't a fancy order, just an entire fried chicken and four roasted potato halves. was fresh. It was succulent. It was ridiculously good and we'd have been happy having the chicken and nothing but. That -but- being if we ate all of it at one sitting, that's where it would end up. After all, we're talking ten pieces of chicken here. So after having a moderate portion, we asked for a box and sought after pie. This pie... well, we were warned. Both Grav and I were already overloaded from a day of trying this and that, and we intended to take our courtesy bite each and pack it in a box for the drive home, but that didn't happen. 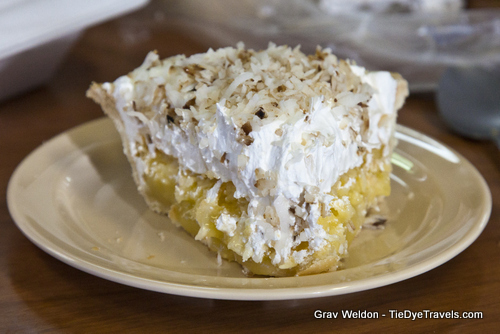 No, that gorgeous slice of coconut cream pie was fussed over, photographed repeatedly, sampled and then destroyed. And then another was ordered... and consumed. Grav demanded I make an addition to the pie book, which had already been out a year and a half, because we had made a grave omission. This pie deserved to be in the book. Heck, this pie deserved to be on a best-of list somewhere. That night in our hotel room in Jonesboro, I was awakened to the sound of a refrigerator door opening. Grav was going back after that chicken. It didn't make it back to Little Rock, either. 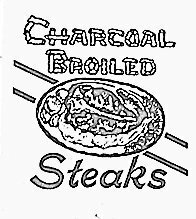 There are many other things on the menu, including some steaks that I hear are legendary. There are sandwiches and salads and what's purported to be Clay County's best catfish. A look at this Facebook page will show you the specials boards from the past couple of years, with an ever-changing array of homecooked dishes available for the order. between 2008 and 2014, the Cold Plate went up a dollar in price. The Whole Chicken special went from $10.50 to $10.99. Hey, that's a pretty good price. You'll find Parkview Restaurant just inside Corning on US Highway 67. It's open every day at 5:30 a.m. and closes at 9 p.m. every day, except Sunday when it closes at two o'clock. Check out the daily specials board by peering over at the restaurant's Facebook page. This restaurant was originally called the PanAm Cafe because it was located next door to a Pan Am service station owned by the O.L. Woods family. He was my great uncle. The original cafe had the counter and booths in front, and that was it. 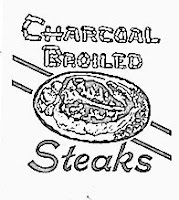 The rest of the restaurant was built in the mid 1960s. 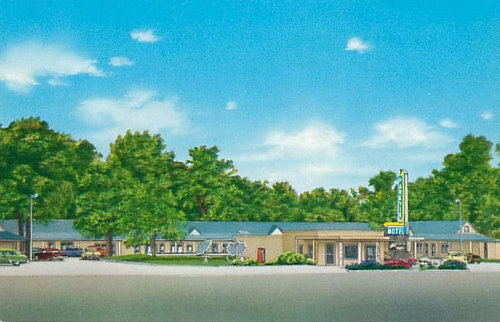 The Parkview Motel was opened in the mid 1950s when U.S. 67 was the main route from Little Rock to St. Louis. The motel had a pool which was open to the locals from 2 to 5 pm daily. During vacation season many tourists would stop at the Parkview to spend the night, and eat at the PanAm Cafe. As a teenager I spend many a summer around the pool and would get soft drinks or shakes at the PanAm. Great memories, and glad to know the restaurant is still around. John E. Barnes, Little Rock. 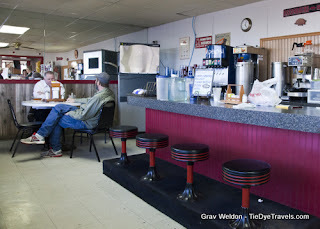 These days my aunt Amy Jordan owns and operates this lovely old country diner. 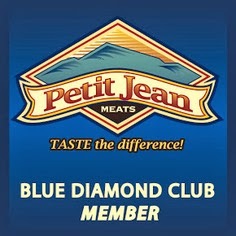 It is a wonderful establishment and sports many types of meals for folks. But, to my surprise they have recently added a special family recipe that is a one of a kind. Chocolate gravy and biscuits. It was a special treat that my granny made for us at breakfast when we visited overnight. And we all sure loved it! And I guess others in Corning must have known about to because when it is her special, I hear she flat sells out. So next time your there check it out. Elizabeth Fowler-Million.